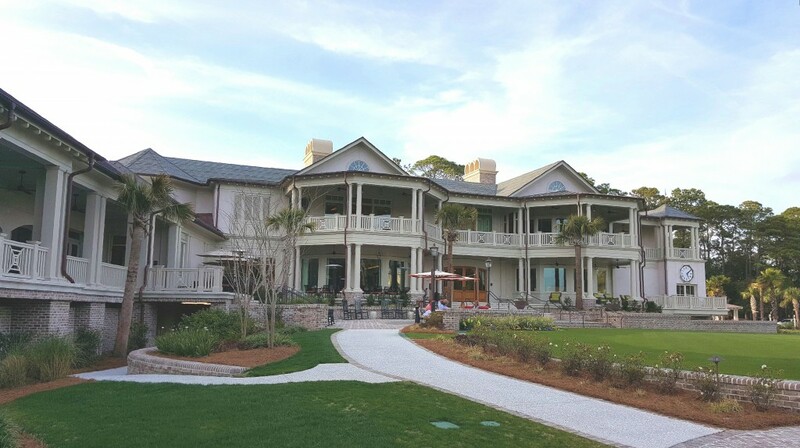 Few PGA Tour events are blessed with clubhouses as spectacular as this one at Harbour Town. HILTON HEAD ISLAND, South Carolina – It’s inevitable, I suppose. Major improvement projects that impact a PGA Tour event will get more attention than ones that don’t. That’s why you can’t downplay all that’s been done at Harbour Town Golf Links. This home base for the RBC Heritage Classic, coming up on April 14-17 – the week after the Masters – has been in a state of flux for a while. The original clubhouse for that course, built in 1969 – the same year the Heritage was played for the first time — was demolished after the 2014 Heritage Classic and its replacement was somehow ready in time for last year’s tournament. How a $25 million facility can be constructed in less than a calendar year amazes me. The new version is spectacular. It has 4,000 square feet of lockerroom space, a 1,900-square foot pro shop and a 2,200 square foot banquet and events space on the top floor. Inside, on two floors, are paintings covering the Wall of Champions. The entire project, measured at 55,000 square feet, isn’t just big. It’s awesome, and no other PGA Tour event is blessed with a home clubhouse this good. When the PGA Tour stars return for the 2016 Heritage they’ll find a new golf course. The Harbour Town Golf Links was closed after Jim Furyk’s victory in 2015. The course was re-grassed and a new irrigation system installed. The course was re-opened for play last fall and now the PGA Tour players will weigh in on the course updating. Chances are good they’ll love it, as Harbour Town has long been one of their favorite stops. 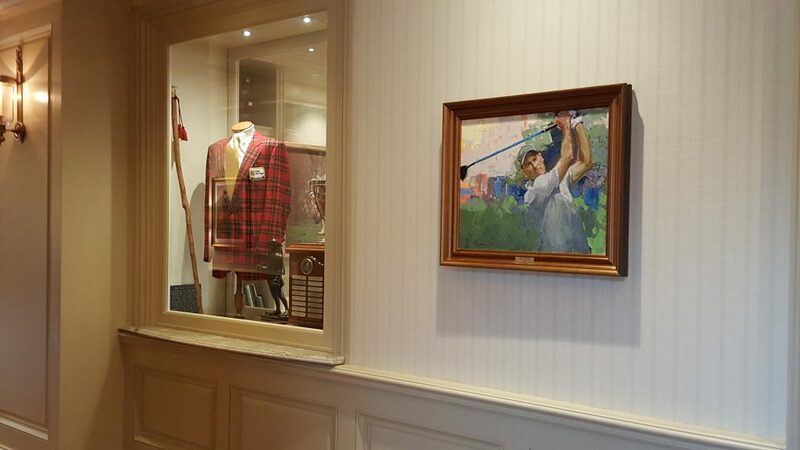 The Jim Furyk painting is the newest addition to Harbour Town’s Wall of Champions. Falling right after the pressure-packed Masters, the Heritage offers a more relaxed atmosphere – one that is ideal for family time while still providing a title well worth winning. Over the long haul Hilton Head isn’t just about one big week of tournament golf. It’s a vacation spot so good that the International Association of Golf Tourism Operators named Hilton Head Island as its North American Golf Destination of the Year for 2016 and Golf Digest has listed Hilton Head as one of America’s Top 10 for Buddy Trips, for Best Courses, Value, Lodging, Weather, Couples Trips and Food and Drink Locations. 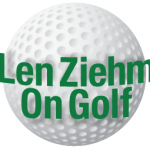 What might get lost in the over-the-top work done at the tournament venue is that significant improvements have also been taking place at Hilton Head’s other golf facilities. In fact, no other golf destination has spent so much in a very short period of time. Golf Etc. was setting up operations during our visit to the Robert Trent Jones Oceanfront Course at Palmetto Dunes. To be clear, there’s much more than golf going on at Hilton Head. Our latest visit showed there were lots of happy, healthy people. They were enjoying hiking, cycling and strolling along a beautiful beach. But golf is the big thing. During the last three years over $250 million has been invested in new construction and renovations by the area’s course owners. That’s why there’s so many good golf options in the Hilton Head area. Counting the nearby towns of Bluffton and Beaufort, there are 28 courses available – and they’re all good. Pete Dye, who designed Harbour Town, also was the architect for nearby Heron’s Point. It was South Carolina’s Golf Course of the Year in 2015. The Plantation Golf Club Clubhouse, which serves the Heron’s Point and Ocean Course players, was the Golf Inc.’s 2015 Clubhouse of the Year. Other designers whose creations adorn the Hilton Head community include Arthur Hills and George Fazio, who have courses in their names at the Palmetto Dunes Oceanfront Resort; Bob Cupp, the architect for Palmetto Hall; Rees Jones (Oyster Reef and Country Club of Hilton Head), Jack Nicklaus (Golden Bear and Indigo Run), Gary Player and Bobby Weed (Hilton Head National), Davis Love III (Eagle’s Point) and Arnold Palmer (Crescent Point). Those places are making things happen, too. Palmetto Dunes’ Arthur Hills Course is the first course we’ve visit that offered the Golf Bike to its players. Palmetto Dunes Oceanfront Resort, for instance, designated its delightful Arthur Hills Course as the first on the island to offer Golf Bikes. They’re among the newest things for on-course transportation and three are available for rental at the Hills layout. Our tester used one for nine holes and got a great workout. 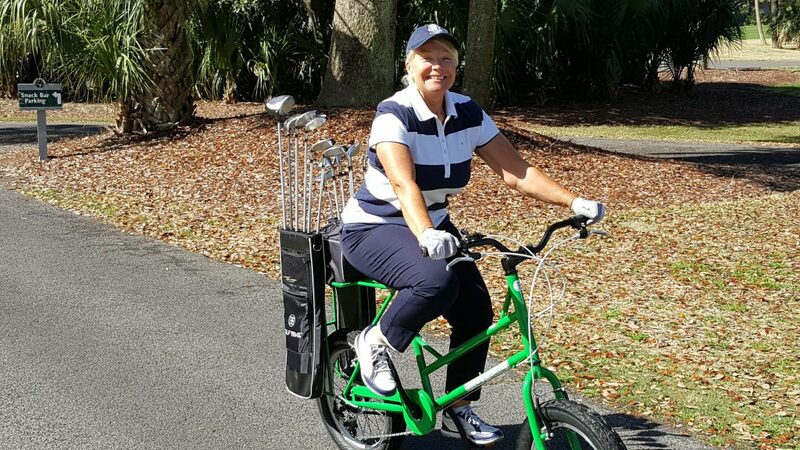 While ride the bike didn’t help her golf game on that day, it was still a fun experience. Another of the three Palmetto courses, the Robert Trent Jones Ocean Course, has added Golf Etc. 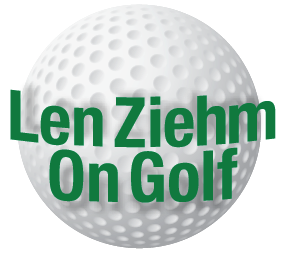 – an elaborate club-fitting, building and repair facility. 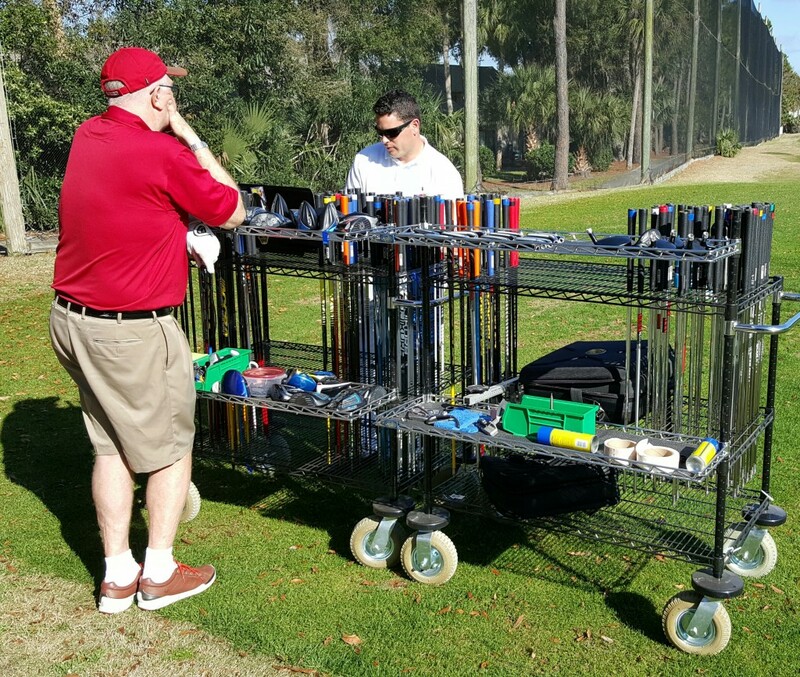 Club fittings are done in an outdoor setting that permits full ball flight. And more than 20,000 total club and shaft combinations are possible with the products of Titleist, Cobra, Callaway, TaylorMade, Nike, Ping, Mizuno, Edel, Fujikura, Matrex, Aerotec Steelfiber, Nippon, KBS, TrueTemper, Accra, Paderson and others available. Harbour Town may be the celebrated course in Hilton Head but it doesn’t get all the attention. In fact, this year it’s a clearcut No. 2 behind Ocean Course. That layout, the first 18-holer built at Hilton Head in 1962, is closed to allow for a major renovation supervised by the Davis Love III design group. Love, again the U.S. Ryder Cup champion, won the Heritage five times and is just the man to take another course in the area to a new, higher level. When he’s done with the Ocean Course the Hilton Head golfers will have still another good option – as if they really needed one! 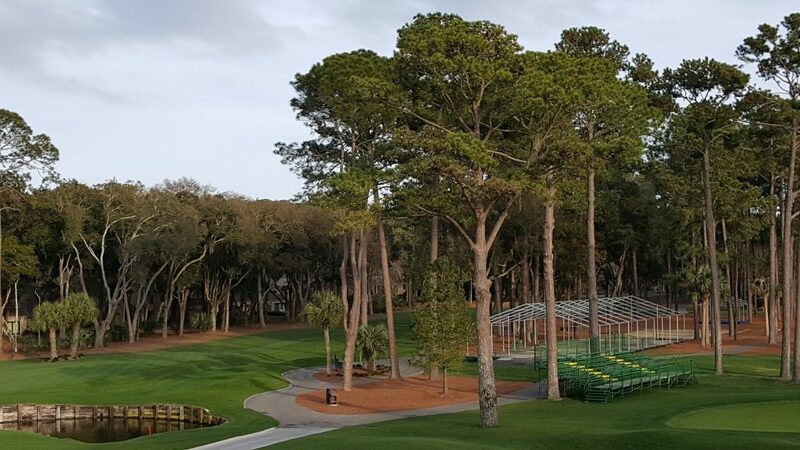 Harbour Town’s renovated course is being prepared to host its first RBC Heritage Classic.